Last unit (TOP floor Penthouse) 3bedroom 2 bath 128.6 sqm A$1.73mil with 2 carpark. Invest Melbourne with One-Stop Solutions: Contract Signing, Tax Consultant, Lawyer, Bankers, Property Inspection &Management… we are with you for every stage. Stunning View to Royal Botanic Gdn., Albert Park Lake & Golf Course, F1 Grand Prix Circuit, St Kilda Beach, Port Philip Bay, etc. Car Park Lots Car park lot included. Additional car parking spaces are available for purchase. 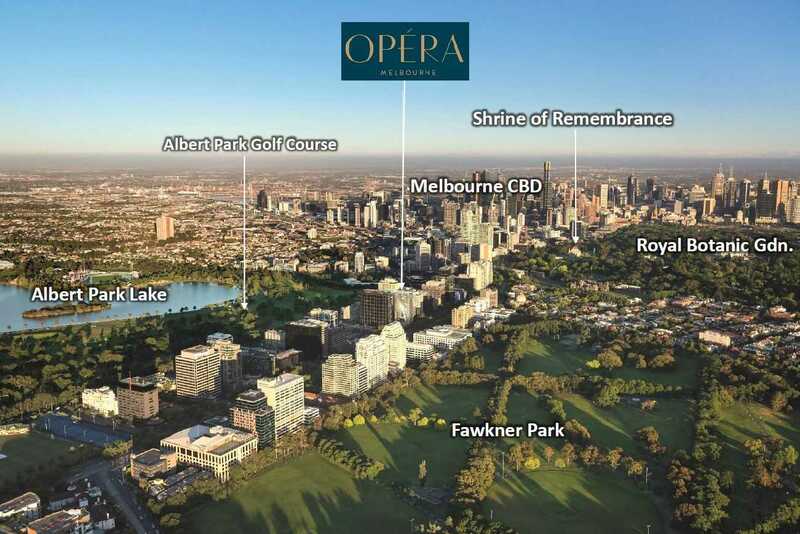 Overlooking the Royal Botanical Gardens, Opera Melbourne is situated on St.Kilda Road, near the corner of Toorak Road abutting the suburb of South Yarra, often regarded as one of Melbourne most prestigious neighbourhoods. The position enjoys close proximity to the Albert Park Lake, Royal Botanical Gardens, Toorak Road and Chapel Street Shopping Precincts, Art precinct, South Yarra Station, and numerous transport routes. The development contains a total of approximately 246 apartments, over 19 levels. With a mix of 1,2,3 and 4 bedrooms apartments. 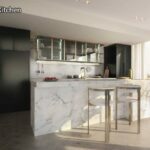 The interior design of the apartments is of remarkable quality, featuring timber floors, Miele appliances, stone bench tops, a modern timber veneer finish in the kitchen, and centralized air‐conditioning. The finishes palette features a blend of natural materials and contemporary products. A spacious one bedroom with plenty of living room space and a nicely sized bedroom that comfortably fits a king size bed with ample wardrobe space. The living and bedroom also both open out to a balcony. 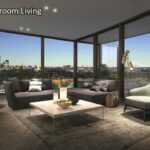 All of the living rooms and bedrooms in the development have been carefully planned to maximize direct access to natural ventilation and light, and many apartments enjoy views of the Melbourne CBD, leafy inner northern suburbs and Albert Park lake. Quality finish with those little extras like double glazed windows, floor to ceiling tiling in the bathrooms and high doors. It is the quality in the detail. Opera at St. Kilda Melbourne also features facilities such as gym, sauna, concierge, private dining and lounge, BBQ and wine room located on the Ground floor. Each of these luxurious spaces has been inspired by the Melbournians love of outdoor living and is designed to enhance the Opera experience. To compare in Singapore context, Opera Melbourne is similar like The Tanglin of Singapore. Colliers International expects a limited apartment supply for St Kilda Road in the next five years. “There are currently no apartment completions forecast from 2016 onwards in this precinct, making 450 St Kilda Road an ideal proposition for developers wishing to capitalise on the limited supply situation,” Mr Rathgeber said. The Golden Age Development Group is a privately owned property development company based in Melbourne. With a focus on developing premium residential projects within inner city Melbourne, the group is committed to designing and developing signature, high‐end quality developments. With years of experience in Asia, Golden Age combines knowledge and expertise within their team of talented architects and interior designers. Golden Age has made a name for itself by embarking on projects in the Melbourne CBD. Past projects include the five star Sheraton Hotel on Little Collins Street and Jade Apartment, the winner of the 2011 RAIA State and National Award for multi-residential projects. Golden Age is the only developer in Victoria to receive this award. John Street Box Hill ‐ 65 apartments, winner of RAIA State and National Awards for Multi‐ResidentialProjects. 450 St Kilda Road was purchased during April, and has since seen Golden Age act briskly to facilitate a Bates Smart-designed tower of 19 levels. The location and ever increasing prowess of Golden Age should ensure the immediate success of 450 St Kilda Road upon release. Why Opera at St.Kilda Rd? 1. Low entry level with Only 10% down payment, balance deferred till completion. 2. Freehold Tenure situated at St Kilda Road in the heart of business district. 4. Inner city living, yet near to Melbourne CBD, Universities, Burke Street Malls, CROWN Casino, YarraRiver, Flinders Street Station, etc. 9. Fulfil criteria as investment property now or live in for children education and future retirement home. Opera Melbourne is located near the corner of St.Kilda Road and Arthur Street, and as such benefits from extended distance to the nearest buildings in the southern directions. As at May 2015, in the southern direction, the building located directly adjacent is 2 storeys at the front and high. In the northern direction, the building located directly adjacent is approximately 6 storeys high. Allowing the building to take advantage of the city views. The development address is 450 St. Kilda Road, Melbourne. St.Kilda road is Melbourne’s gateway and spine to it’s heart, the city(2.9km). Combined with elegant tree lined boulevardes, classic Architecture, Melbourne’s most exclusive boutiques and the financial heart of the city. 450 Saint Kilda Road has a Walk Score of 85 out of 100. This location is Very Walkable so most errands can be accomplished on foot. This location is in the Melbourne neighborhood in Melbourne. Nearby parks include Bowen Crescent Reserve, Fawkner Park and South African Memorial Reserve. building on St. Kilda Road. b. The remaining two (2) copies are to be returned to Golden Age office for processing. Together with “Contract Execution Checklist” & TT 10% payment ” Tisher Liner FC Law Trust Account “. Buyer’s S$5,000 will be refunded upon acknowledgment of receipt from Vendor Solicitor.